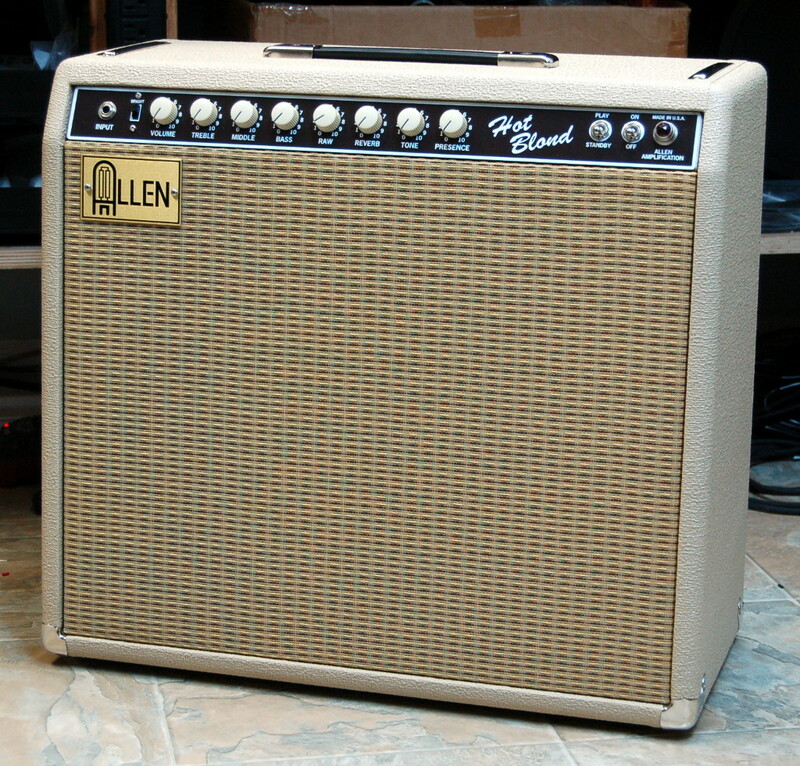 The new Allen Hot Blond amp is my take on the iconic 1963 Fender blond Bassman (6G6) head's normal channel. I added the much desired tube driven spring reverb plus a few other useful features to make the amp more versatile while maintaining its original character. It f eatures adjustable fixed bias with measurement jacks on the back, an impedance switch for 4 or 8 ohms, a bright switch, a middle control, a TONE control for the reverb and my unique RAW mid/gain control. I feel that blond Bassman was all about getting the most clean headroom possible (short of going to an ultralinear output transformer) out of a pair of 5881s. Like the 59 Bassman and the Concert, this amp has a HUGE output transformer. The 6G6 had a solid state rectifier and a high B+ voltage which keeps the amp clean to a higher volume. Brian Setzer of the Stray Cats has made this particular amp very popular to Rockabilly/Gretch players. It has the clean headroom to keep the percussive thump and click of those Rockabilly basslines tight and punchy. From Country chicken pickin' to Blues or Surf or Jazz or Rock, it is a great platform to work with. 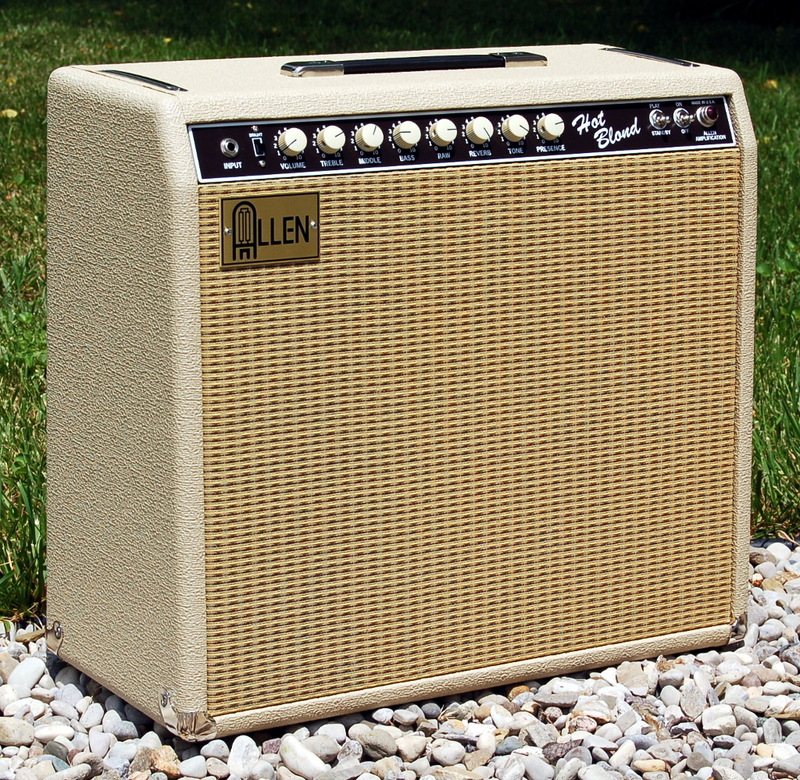 It is available as a head with separate speaker cabinets or as a 1x12, 1x15 or 2x10 combo amp. The stock amps are blond/wheat with cream barrel knobs, Tung Sol or JJ 5881s, (4) 12AX7s and your choice of a plug-in solid-state rectifier or a tube rectifier. Gold and Oxblood grill cloths are also available. Like all Allen amps, it features top quality components throughout. Finger-jointed pine cabinets, stainless-steel chassis, glass epoxy eyelet board, Switchcraft jacks, Carling switches and so on. 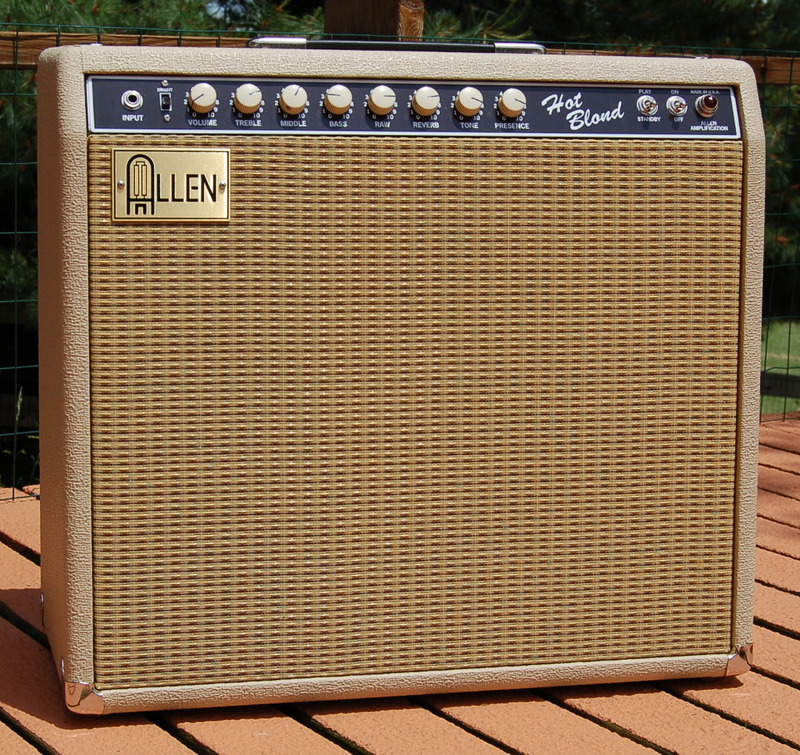 At 40 watts, it might be too much amp for some playing styles or situations. With a tube rectifier installed and the convenient bias jacks and adjustable bias, the amp can easily be set up with 6V6 power tubes for 22 watts with either an 8 or 16 ohm speaker load. Click here to read a review (pdf) of the Hot Blond 1x15 from the October 2016 issue of Vintage Guitar Magazine. 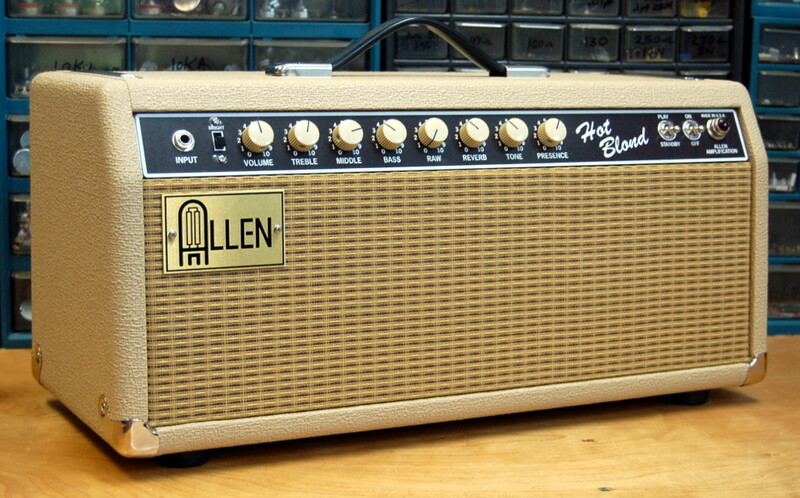 Tony Sims checks out the Allen Hot Blond amp. 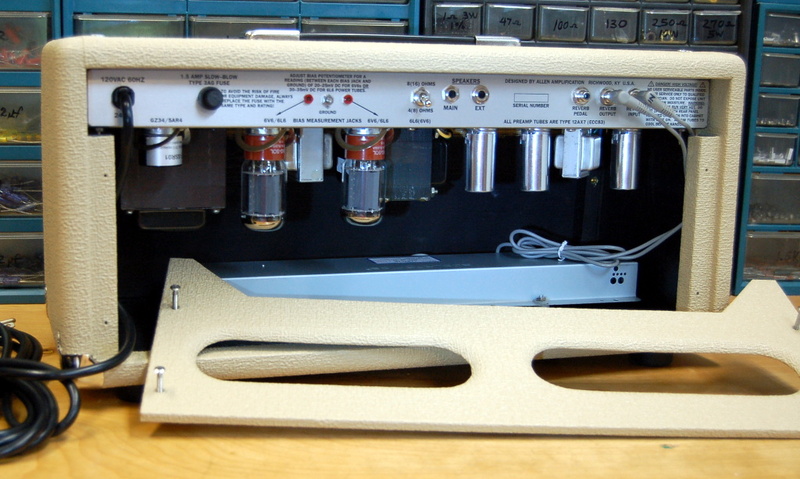 Hot Blond Head shown with plug-in solid-state rectifier. Tube rectifier can also be used. To place an order or for more information, call 859-485-6423 (8:00am-5:00pm EST) or click here to email Allen Amps. © Allen Amplification. All rights reserved.